Yes, it’s certainly getting to that time of the year again when we think of resting and taking stock of the year, wrapping presents and enjoying some leisurely time with friends, family or both. It’s also that time when the Christmas trees are unpacked and adorned with decorations. 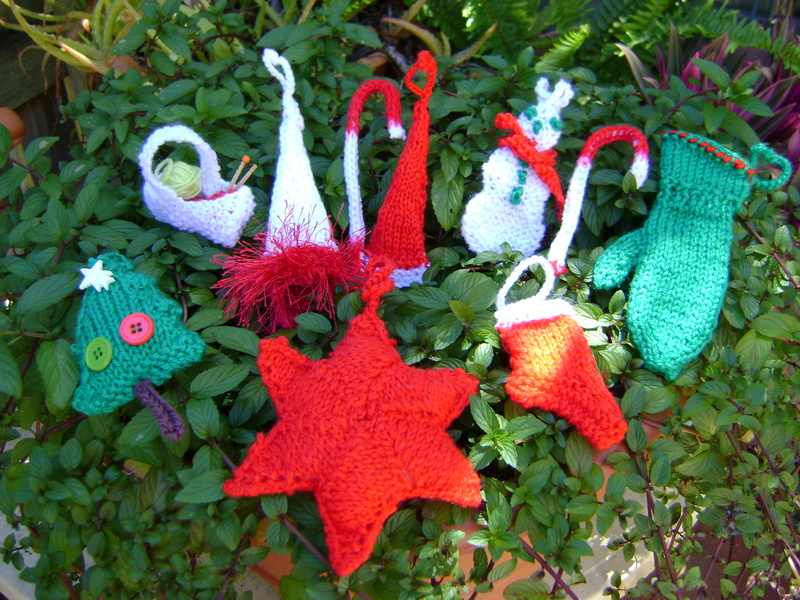 Last year I knitted a lot of my decorations and I was delighted with the results. They’re quick to make so you get instant gratification. And they’re great for using up those last bits and pieces of yarn. I have to confess that I used acrylic to knit them. I’m a bit of a yarnaholic however acrylic does have its place. 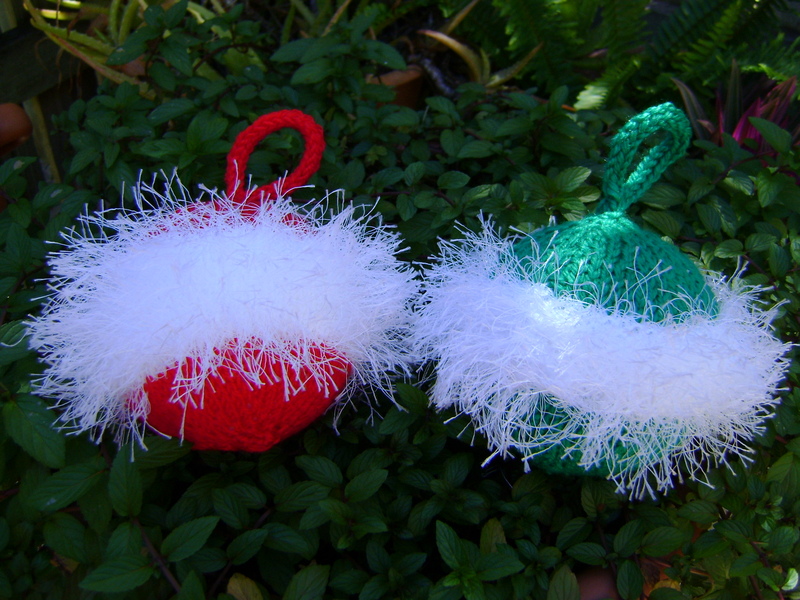 This Candy Cane Christmas ornament is so easy to make. I simply knitted an I-cord around a pipe cleaner. I used a red/white variegated yarn and it looks very effective. How easy is that? The knitting pattern for the mitten featured on the far right hand side of the picture can be found here. It’s so easy to make and really adds a Christmasy feel to your decorations. Isn’t that little yarn basket at the top left hand side of the picture just adorable? 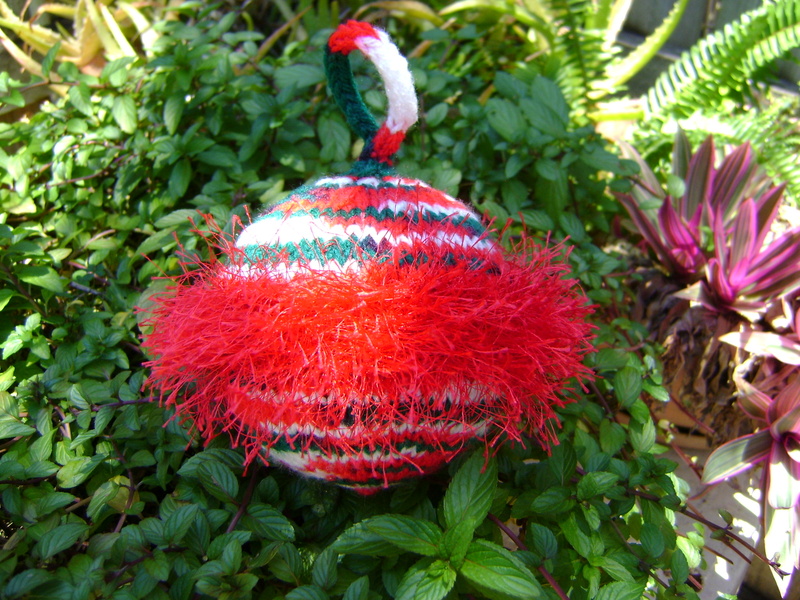 It would make a perfect little ornament for your Christmas tree or you could knit a few and give them as small gifts to your knitterly friends. You can find the pattern here. The knitting pattern for the white santa hat on the left hand side of the picture can be found here. The added eyelash yarn really adds to the appeal of this pattern. This little snowman is another easy and quick knitting pattern to complete. He can be found here. The Christmas tree at the bottom left of the picture is knitted with this pattern. You can decorate your tree with small buttons as I did. Again, let your imagination go and you’d be amazed with what you can come up with. The pattern for the little Christmas stocking at the bottom right hand side of the picture can be found here. Again, another easy peasy pattern. 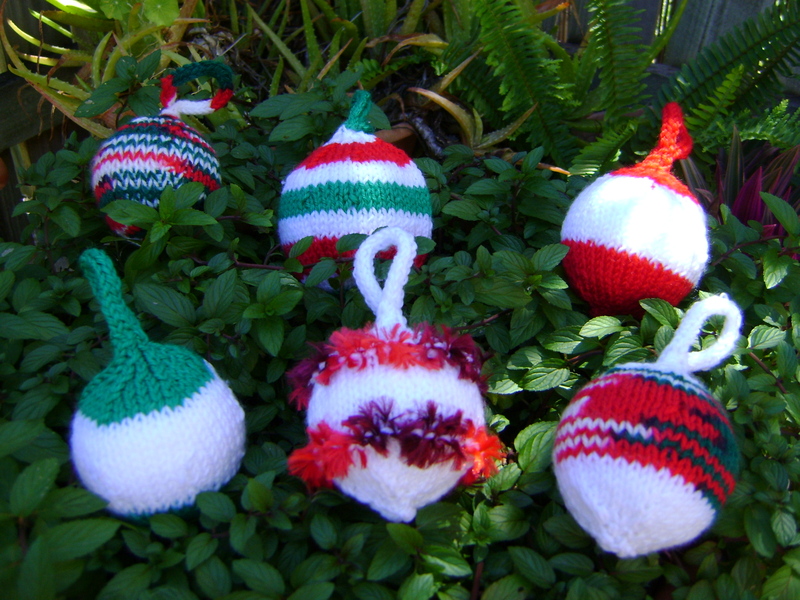 There’s a plethora of free Christmas decoration knitting patterns at Knitting Pattern Central and Ravelry. You’re sure to find so many you’ll want to knit. 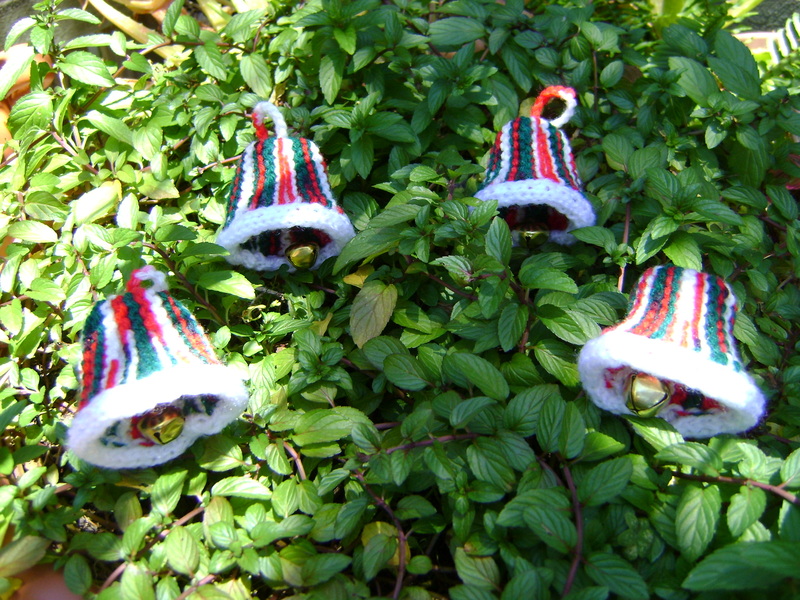 I love these little Christmas bells so much that I’ve knitted heaps of them. The free pattern can found here. I used Moda Vera Marvel for the main part of the bell and Lincraft Sport for the white rim. 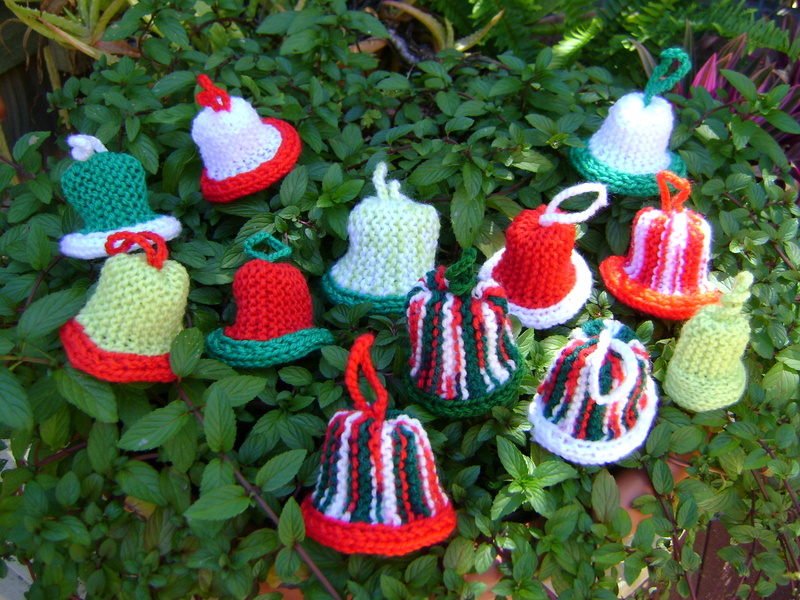 Here’s another picture of some more Christmas bells knitted in all different types of acrylic yarn. 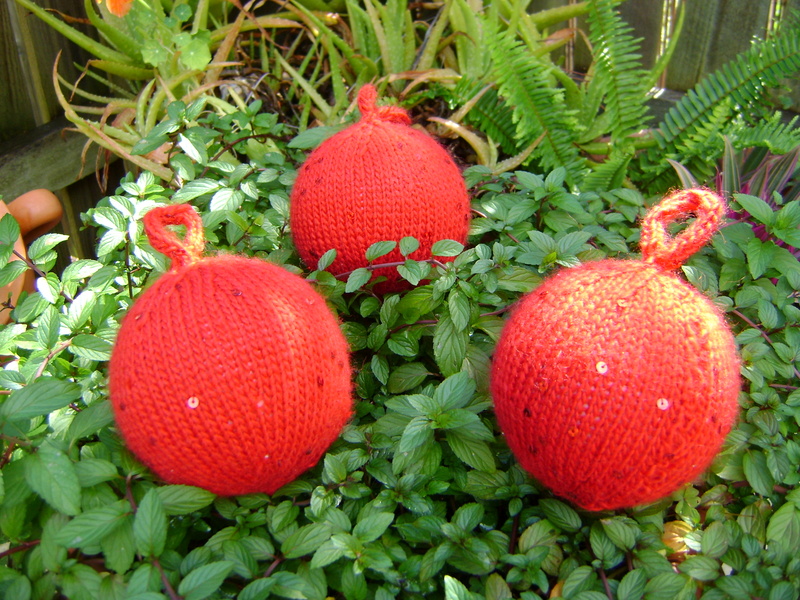 These Christmas baubles are also sooo easy to make. The pattern can be found here. I followed the basic pattern but changed colours where I felt like it and also used eyelash yarn to provide a bit of variety. And then I got really adventurous and purchased different sized polystyrene baubles and adjusted the pattern and these are some of the results. I hope you’ve enjoyed viewing all my knitted Christmas decorations and I hope you’re having as much fun as I am knitting so many different colour and style variations. Have a fabulous rest of your weekend. Happy knitting or crocheting or whatever you enjoy doing. Talk soon.